Walmart has a perfect broadcasting starter bundle featuring an Audio-Technica condenser microphone with accessories all for just $124.95. 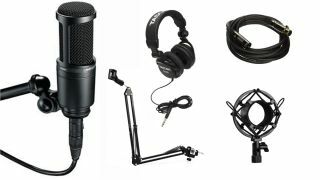 The bundle also includes a pair of Tascam closed-back headphones, 10ft XLR cable, pop-shield, shock-mount, boom scissor-arm stand and microfibre cloth. Not bad considering that the mic itself still regularly retails for around $100. The list price for all of the products comes to $211.62, saving you a very respectable $86.67. To take advantage of this packaged deal, head on over to the Walmart website now.